Annotation: At the start of their post graduation summer road trip, Colby’s heart and future shatters as Bev announces her abandonment of their long time pact to not attend college and travel Europe together. So what now? Plot Summary: Long time friends, Colby and Bev have big plans after high school. Road tripping with their band, The Disenchantments, for the summer and while everyone goes off to college spend a year backpacking around Europe. Just after leaving San Francisco for the start of their road trip, Bev reveals to Colby that she is forsaking their plans and going to art college in the fall. Besides breaking their long awaited plans, Bev also shatters Colby’s heart. However, they have the rest of the summer together as Colby has committed himself to band manager of Bev’s all-girl band as they tour the Pacific Northwest. So what will happen to their friendship and where will Colby’s future lead him? Critical Evaluation: Unlike Hold Still,The Disenchantments focuses on a point of view of a male narrator, Colby. Colby who finds himself struggling with the question “what’s next?” when best friend Bev drops their long standing plans to wander Europe for a year. I normally don’t read a lot of books featuring the male pov, but the struggles Colby faces about his friendship with Bev and his potential future makes him a narrator I could easily connect to. I think most of us, in our lifetimes, face the question of “what’s next?”. That is what emotionally connected me to the story. I am in the same place Colby was in at the beginning of the story; struggling to find out what’s next in life. It is not only Colby that makes The Disenchantments a wonderful story. The whole complex cast of characters from sullen, mysterious Bev to vibrant pink haired Meg to organized Alexa with her notebook of potential careers and all the people they meet along the way add to the charm of the story. The relationships between them are so fraught with tension, laughter, conflict and everything in between and Nina LaCour portrays it beautifully. The characters come so alive that I feel like I could bump into them on the street or see them hanging out in a cafe. Additionally, the themes help makes this book resonates. 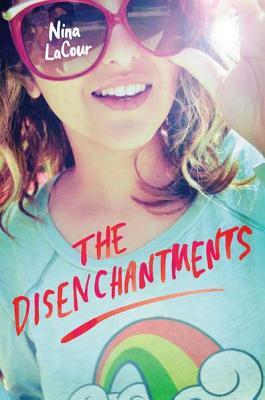 Themes The Disenchantments touches on the meaning of friendship, the possibilities of choice, the power of art and music, and the potential of the future – things that most people can in one shape or another connect with. A vibrant, radiant book that I cannot recommend enough. Challenge Issues: To defend this book, I would mention that it is a Booklist starred review, give them this lovely Kirkus Review, and this interview with the author.